The success of its two hatchbacks - the Aveo U-VA and the Spark and new releases from other automakers - has spurred GM India to think of bringing the Chevrolet Mini sooner than ever! 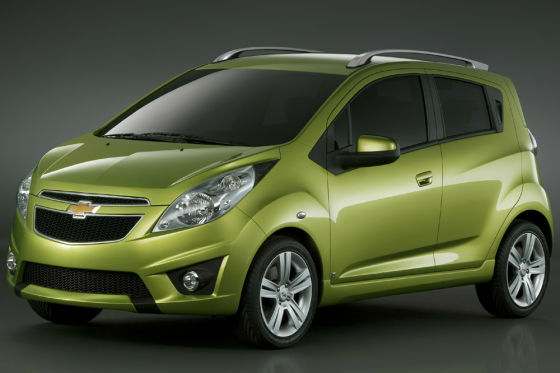 GM is now working out all odds to bring in the 'Mini' and heat up the premium hatchback space. The Chevrolet Mini which is based on the Beat concept (showcased two years back in New York Auto Show) will come with frugal Petrol and Diesel engine options; expected to be positioned above the Chevrolet U-VA and priced around that range. The Chevy Mini as it appears (in pictures), would be a large hatchback- possibly the largest hatchback India has seen (we'll leave out the SRV for now)! But this is just a speculation (a visual perception), as no dimensions have been revealed yet. Once launched, the Chevy Mini will have to slug it out with other premium hatchbacks like Honda Jazz, Fiat Grande Punto, Skoda Fabia and the newly launched sales phenomenon Hyundai i20. GMI's new powertrain (engine and transmission) plant, in which it invested $200 million (around Rs 800 crore), will crank out small petrol and diesel engines of 1- 1.5 litre range in 2010 when it will be commissioned. Given that the small car market comprises more than 80% of India’s total car sales, GM is looking at tapping this market by offering multiple products under one Chevrolet badge. "The small car market is compartmentalizing into different segments and hence, our multi-product strategy," Mr Slym said. Chevrolet saw sales numbers of 65,000 units last year in the domestic market, which is a a growth of 10 per cent. These numbers have been achieved in spite of a two percent drop in overall passenger vehicle industry. The company currently boasts of a market share of up from 2.9 per cent in 2007 to 3.4 per cent in 2008.